What if they are lost forever? Afterall, it is a big world with vast oceans. Nella sets out to sea with her friends Pekko and Egil, but they are shipwrecked in a storm. The raft they manage to build takes them from bad to worse as they do not reach safety but Hiittinen. The lands are ruled by a warring king who enslaves the children. Egil is tasked with the making of an explosive, The Dust of Thor, which the kind plans to use to conquer the known world. But when Nella’s fate begins to look worse than a slave’s, Egil shows he isn’t a Viking king’s son for nothing! 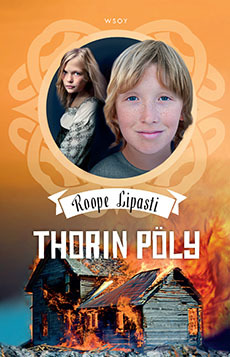 The Dust of Thor is the second book in the Viking Trilogy by Roope Lipasti. The first book in the trilogy The Viking Knot won Roope Lipasti both the LukuVarkaus and the Kirjava Kettu Awards.